But, Bhagawat Geeta is a special Song where the Lord directly talks to us(Jeevas). It is indeed laid out by Great Satguru Lahiri Mahasaya and Unfathomably great Mahavatar Babaji that all people practising Kriya Yoga should atleast read a few passages from Sri Bhagawat Geeta DAILY. Each Verse of the Song bursts with power to provide Salvation. Each Verse has the capacity to take us to the Infinite. There are some that provide solace to me when I am lonely, some cheer me up, some direct my thoughts back to the Divine. Whenever I am sane and I am sad, I look forward to the Voice of the Lord to Guide me. Ma karmaphalahetur bhurma te sangostvakarmani." 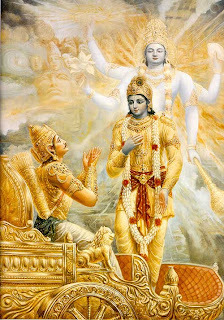 The Great Lord says, "Karman Eva Adhikarasthe" - You have control only over your actions. This does indicate, the God was kind enough to offer us free will. There is no point doing evil and claiming Goda sked me to do it. Sri Krishna Paramatma says that we have control only over the actions and NOT over the results. IMO, He does not say, do things without expectation. An action done without a goal will not yield good results. The action should proceed towards a goal or a cause, and we have complete control over our actions. (conditioned by our own Vasanas acquired over many many births)But, we cannot control the results. The Lord grants us the results based on many factors (infinitely large) that are not under ourcontrol. God does not give results randomly. He only says the outcome of an action is not under our control (sounds like Quantum Physics to me!) . Does that mean we can give up action? The answer is a thundering NO - Arjuna did not toss his Kanteepam (his bow) and retire to Sanyasa after listening to Bhagawat Geeta. He took his bow and fought themost valiant battle.Lord does not discourage us. If we put in the effort, the most Merciful One will grant the fruits.We should do our duties with utmost sincerity, hard word and devotion. If we do not attempt we will not get any result. Not doing duty is not what the Lord preaches. Do what you can do your best - But, Do not have the results of the action as your motive. Dedicate all the results to Lord. By dedicating the results of all actions to the Lord, we will be purified. This is the end result of Karma Yoga. May Sri Krishna, Lord of Infinite Mercy, The Most Beautiful One, Charmer of the Gopis and Radhas, The Charming Kid who Danced on Kalinga, The Upholder of Dharma in the Universe Grant us theUniversal vision to see Him in All and All in Him. Sarvam Sri Krishnarpanamasthu! Hare Krishna! 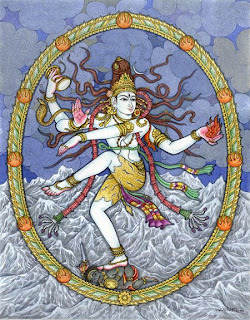 As I was meditating over Lord Nataraja, esp moved by His Grace in recent times (which extends even to this mundane world), the poem(? )below sprang into my mind. I thought I should share it with you. Who supports me, the most undeserving one. His Dance, pervades the entire universe,And Transcends it. Brings Him running for Help. Doing petty comparisons.He Blesses even them. A ray of His Grace. Is a heart that yearns for His Grace. PS:- Image Attribution: Copyrighted to Himalayan Academy Publications, Kapaa, Kauai, Hawaii.